If you don't immediately fall in love and want to do kid's hedgehog crafts after seeing this photo, you might need to see a therapist. You might need to see one anyway since they are so cute you might not be able to stop making hedgehog crafts. Wow, I may need to make this into a screensaver. To make these porcupine masks, just go to our porcupine mask diagrams and print them out. Follow the directions on that printed page. 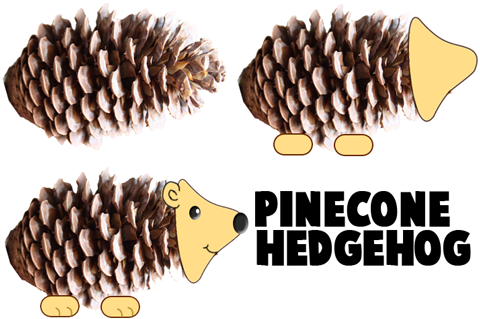 To make this cute hedgehog character you will need a pinecone and some clay. Take some tan clay and push it into the front of the pinecone...then try to form it into a bell-like shape as seen in the 2nd picture above. Make 4 oval shapes and stick them on the bottom of the pinecone for the feet. Take black clay and form it into a ball and push it onto the tip of the bell-shaped clay for the hedgehog's nose. Form 2 more black ball shapes for the eyes. Form the smile by drawing it in with a toothpick. Draw in the toes with the toothpick as well. Take some tan clay and form it into a small ball to use as one of the ears...do the same for the other ear. Let dry to harden. How to Draw Cartoon Porcupines & Hedgehogs - How to Draw Cartoon Porcupines and Hedgehogs. 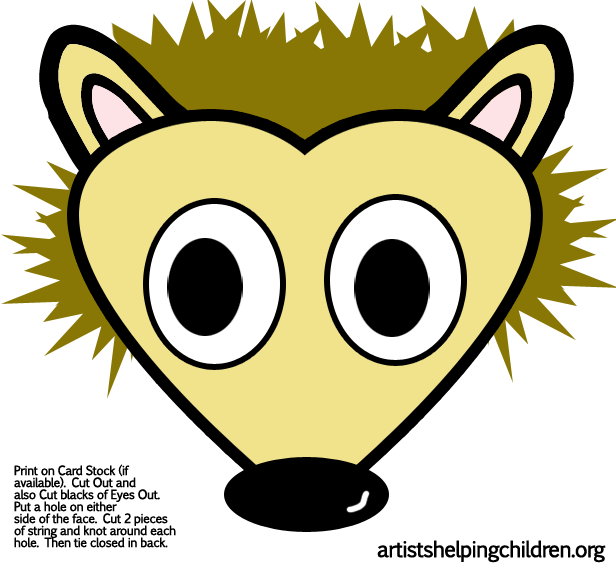 Drawing Cartoon Hedgehogs - Learn how to draw cartoon hedgehogs in easy steps. Autumn Hedgehog : - This hedgehog is a pretty autumn window decoration which is easy to make. It is suitable for children of primary school age and, depending on the ability and age of the children, takes approx half and hour to three quarters of an hour. Clay Porcupines Craft Activity for Kids - - Make a porcupine with using clay, popsicle sticks and uncooked spaghetti! How to Draw Sonic the Hedgehog - Learn how to draw Sonic the Hedgehog. Hedgehog Mechanical Paper Toy Craft - This is a moveable, paper model craft of a Hedgehog (I think). 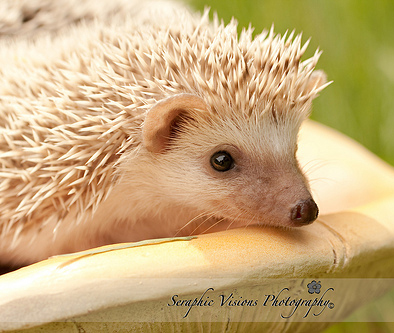 Hedgehog Pet Paper Weight - In this tutorial you will learn how to turn a rock into a pet hedgehog. How To Make a Friendly Foam Porcupine - - Ever wish you could cuddle up to a cute little baby porcupine without getting hurt? Well, now you can! How to Make a Porcupine Costume for Parents to Make - - DIY costumes give you a chance to get creative, and this fun, homemade porcupine costume is no exception! Illuminated Porcupine Dog Costume - - Alison Lewis, artist and editor of Switch blog, created this brilliant porcupine costume for Francesca. Make a Prickly Porcupine! - - This prickly porcupine project is more than just crafty fun! It will actually teach your child about the ingenious defense mechanism found in the common porcupine. Although it is a small rodent, the porcupine's prick is mighty powerful! It will make a lasting impression on your family pet's tender nose if given the chance! Make sure your child knows that the porcupine is not just a mean-spirited creature. He is actually doing his best to protect himself and his family! Porcupine Craft for Kids - - Okay, a porcupine may not be on the top of your list as favorite cardboard tube animals, but after seeing this kids craft completed you may change your mind. This one's different and fun to make. Porcupine Crafts for Kids - - If you know a child who is fascinated with porcupines, give him some interesting ways to create little porcupines of his own. No matter how young the child, he'll be able to use simple materials to make little creatures that look just like live porcupines. Porcupine or Hedgehog Paper Plate Craft for Youngsters - - Becky from Becky's Beehive FCC sent in this cute paper plate craft. Depending on where you live or what theme you are doing it can be either a porcupine or a hedgehog. Porcupine Pin Cushion - - I thought that I was pretty clever when I came up with this. Come to find out, people have already made porcupine pin cushions. But have they mistakenly filled them with disgusting artificially pork-flavored dried pinto beans? I think not. So here is Porc&Beans, the unofficial Prudent Baby mascot. The best part about Porc&Beans is how much my 2yr old wants to play with him even though he is stuck with 100 sharp objects. So fun. Porcupine Prickles Arts & Crafts Ideas - - Stand back! W-a-y back! Real porcupine quills can prick! Will your critter be friendly or fierce? Porcupine : Prickly and Cute! - - Create a cute creature of the night from a pinecone! Porcupine Tooth Pick Craft for Preschoolers & Toddlers - - Print the page. Have the children color it. Then break tooth picks in half and have the children glue them to the page. 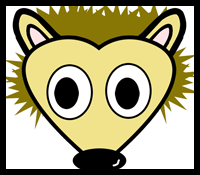 Prickly Hedgehog - - Make a Delightful Hedgehog using an Egg Carton and Lots of Toothpicks! Prickly Porcupine - - I'm not sure how many people actually make porcupines, or how popular they are, but I really thought this little guy was cute. It also involves using a fork for painting which I thought was a bit different. The Playdough Porcupine - - Make this porcupine out of just playdough and toothpick.